It’s been a busy few months for me, between Illimat, Phoenix, and other projects I can’t discuss at the moment. There’s still no news about Eberron development for 5E, and that limits what I can do here. However, in 2017 I will be launching a Patreon to support more extensive gaming-related content on the site. For now, here’s the long-promised Q&A about the Fey of Eberron. What if every story you were told as a child is true? The Sleeping Princess, the Maze of Thorns, the lurkers who wait in the shadows to steal sleeping children. What if all of these things are real, poised just beyond the curtain of the material plane? This is the case in the Eberron Campaign Setting. The material plane is a blending of substance and ideals. The outer planes are purified ideas, realms that embody particular concepts. Shavarath is the eternal battleground; this conflict began at the dawn of time, and it will continue until the end of creation. Shavarath embodies war. Dolurrh is a place of death. Kythri is chaos and change, while Daanvi is order and stability. Fernia is fire and Risia is ice. But what exactly is Thelanis? Lamannia is the plane of Nature… But Thelanis is home to dryads and similar spirits. What does this mean? Personally, I focus on Lamannia as a place of primal nature: iconic entities and elemental forms. While the Greensingers would take issue with this, in my opinion the Fey of Thelanis aren’t part of nature… not even the dryad. The Fey are the magic we wish was in the world. The dryad is the spirit we want the tree to have, when we see a slender willow and think of it as a beautiful woman. But there’s nothing natural about a tree having a spirit that resembles a human woman; it’s something magical, a story we want to believe. For me, this is what Thelanis is. The realm of stories. The realm of the magic we want in the world. The Fey reflect hopes, fears, secrets and desires both conscious and unconscious. But if Thelanis is the realm of stories, how is it different from Dal Quor, the region of dreams? Stories are concrete. They may evolve over time, but a story can hold its general shape for centuries. Stories can hold lessons and morals that ring true across cultures and generations. By contrast, dreams are intensely temporary and personal. Dreams aren’t passed down; they are created anew every night. The quori (the primary spirits of Dal Quor) don’t embody specific dreams; rather, they embody the emotions and forces that shape our dreams, and they themselves have the power to manipulate the content of dreams. By contrast, the immortal Fey are the subjects of stories. This raises the chicken-and-egg question: A powerful Fey resembles the subject of a well-known story. Does the story exist because the Fey exists and has passed her story into the collective unconscious of Eberron? Or has the Fey herself been shaped and ultimately created because of a story mortals began telling on her own? Can a Fey actively change her own story… or could mortals actively change her by purposefully changing the way a particular story is told? There’s no clear answer to this question, and it’s not easily proven either way. You can be certain that it is a subject of debate in the ivory towers of Eberron itself, and in my Eberron novels (notably The Fading Dream) you can see some of the inhabitants of Eberron and Thelanis wrestling with this issue. And looking back to Dal Quor, the Feyspire of Shae Doresh was essentially the bridge between Thelanis and Dal Quor, and may have been a physical reflection of that tie between stories and dreams. It’s easy to think of the planes as being essentially alien worlds. The Feyspires are like cities, so you must be able to walk from city to city, right? This is a dangerous mistake. Thelanis isn’t a planet; it’s a plane. It is potentially infinite in size… and at the same time, it doesn’t follow the physical laws of our reality. The Woodsman lives in a forest beneath the Deepwood Moon, and there is no end to that forest; it is a closed pocket of space, and if you start walking west you’ll eventually find yourself back where you began. If you’re trying to reach the Silver Tree or the domain of the Queen of Dusk, you can’t just get on a horse and ride there; you have to find a path. Inhabitants of Thelanis have gates they can open or slip through, but as a mortal you generally have to follow a story – taking actions that either complete the story of the realm you’re in, or that draw you to a different place. So who are the Fey? What do they want? First of all, I draw a sharp distinction between “fey creatures” – which I define as “mortal creatures from Thelanis” – and capital-F Fey, by which I mean immortal spirits of Thelanis. Depending on edition, gnomes, elves, and eladrin all have the fey subtype. You can find both gnomes and eladrin in Thelanis, and they make up the bulk of the population of the Feyspires. These mortal creatures aren’t substantially different from their cousins on Eberron; they are the courtiers and serfs of Thelanis. An eladrin knight serving in the feyspire of Shaelas Tiraleth isn’t THAT different from a paladin of the Undying Court; both are proud and long-lived warriors who fight on behalf of immortal rulers. That knight is one of dozens of knights, and he isn’t personally embodying some ancient story. His attitudes are shaped by growing up in Thelanis, and his customs will feel strange to people of Khorvaire, but not THAT strange. And he can grow old, have children, sicken, and eventually die. Next we have the lesser true fey: immortal spirits, but with relatively limited power and dominion. Dryads, sprites, and similar creatures fall into this category. Such creatures are essentially immortal. They cannot die by natural means, and their numbers always remain static; when one of them dies a new one will eventually manifest to take its place. Most of these beings have a fundamentally different relationship with time than the mortals of Eberron; they escape immortal ennui by living purely in the moment, giving almost no thought to past or future. A sprite could be thousands of years old, but she might not be able to recall something that happened a week ago, because time has essentially just passed through her. The sprite is almost like a flower; it’s a part of the color of Thelanis, but it cannot learn or change; it simply IS. If they harm you, it’s generally with a sort of innocent, childlike malice; poke the rose and the thorn will prick you. By tomorrow they won’t even remember it. So you can think of these least immortals as “background fey” – they essentially exist as set dressing for stories, and they don’t hold on to many personal details (or feel any loss at this). However, it’s possible that one of these chorus members can get promoted to have a story of their own. In The Gates of Night we encounter two dryads who DO have stories and strong individual identities: Lady Darkheart and the Crooked Tree. As they become part of a story they develop more individual identity and can have goals and desires. But even here, their personalities are only as deep as their story requires. They may be defined by an event that happened centuries ago, and still hold to that tragic romance or bitter vendetta as if there was nothing else in the world. They don’t change in the way mortals do; they can’t simply forgive a slight, unless that in itself fits the shape of their story. But when I talk about “The Fey”, I’m usually talking about the people at the top of the food chain: what mechanically would be called Archfey. Humanoid Archfey are often (though not always) known as Ghaele Eladrin, but it’s important not to confuse them with the lesser mortal eladrin. 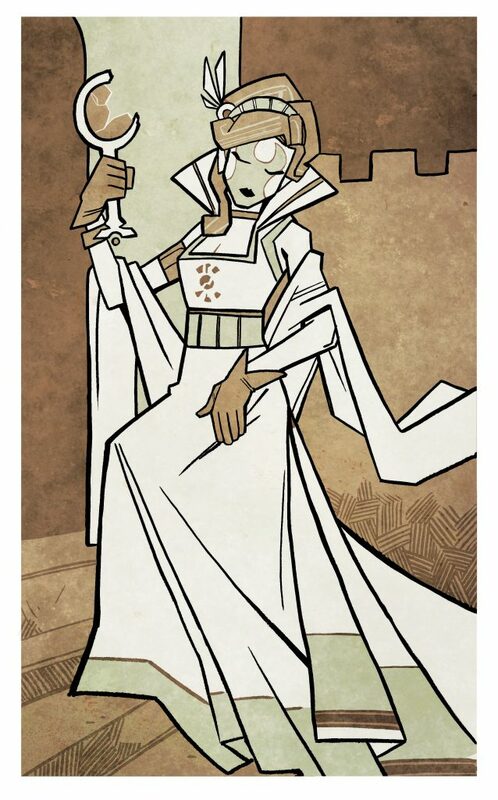 In Shaelas Tiraleth you have hundreds of mortal eladrin, but only one Ghaele: the Lady of the Silver Tree. She is the immortal heart of the Feyspire; it is her story. Ghaele are technically immortal, but their stories can evolve and change. Thus the Lady of the Silver Tree has a father, and some day she could die and be replaced by a prince; but that transition would represent the story that defines Shaelas Tiraleth fundamentally changing. Dragon magazine ran a series called The Court of Stars that profiled Archfey, and I wrote a piece on the Prince of Frost for issue 374 (that’s him on the cover). Here’s a note from that article: “The great powers of the Feywild dance through time unburdened by its chains, leaving their marks in stories and histories. Little can be known for certain about the archfey. Some accounts say that the Maiden of the Moon was once an eladrin who rose to power through passion for the hunt. Others claim that she is a dream of the moon. Perhaps neither tale is the truth. Maybe both are. So it is with the Prince of Frost. It is foolish to seek fact in the Feywild, but one can find stories.” According to his story, the Prince of Frost was originally the Sun Prince and betrothed to one of the three Daughters of Delight. When his lover forsook him for a noble mortal warrior, his heart grew cold… and when she and her lover cast their spirits forward in time to escape him, his heart became ice. Now he waits for his love to be reborn so he can possess her; but in the meantime he takes pleasure in tormenting mortal heroes in memory of the one who stole his beloved. The Prince of Frost is a perfectly suitable Fey to appear in Thelanis. He has long-term goals – find his beloved when she is reborn, torment mortal heroes – and he will recruit mortal agents (Greensingers, Fey Pact warlocks) to help achieve these goals. The issue is that he is defined by his story. He can’t suddenly meet a new love and drop the whole vengeance thing, or suddenly be convinced to take an interest in the war between Droaam and Breland. He is ancient and powerful, but in some ways he is simpler than most mortal villains; he is, in essence, a storybook villain. He can be subtle and clever in pursuing his goals, but at the same time, he’s going to KEEP PURSUING THOSE GOALS FOREVER until the story somehow finally comes to an end. Like the dryad, he doesn’t really learn or evolve… unless his defining story itself somehow evolves. The next critical thing about immortal Fey is that they are bound by rules and storybook logic; this is a thing that can limit them despite their power. Most are bound to keep their promises. The Court of Stars article calls out that a player can gain concrete, mechanical benefits if they learn the true name of the Prince (and can say it); if they learn the song Lady Sharaea composed for her beloved; or if they possess the amulet the Prince of Frost gave to Sharaea. So a mortal gnome can give her word and break it a minute later; but a Ghaele is defined by her words, and can be tricked into making a promise that saves a mortal. All of which brings us back to the question: what do they want? The answer is different for each Archfey. Most of them are simply living out their story and want whatever suits that story. The Prince of Frost wants to torment selfless heroes while searching for his beloved. The Lady of the Silver Tree wants nothing more than the care for her tree. They may be defined by feuds with other Archfey or mortals; essentially, come up with a story and it will tell you what they want. Another question that sometimes comes up is whose stories do the Fey represent? The answer? Everyone. In The Gates of Night, the drow Xu’sasar encounters the ghost scorpion in Thelanis – an important piece of the stories of her people, but one with no meaning to the other travelers. Likewise, she interprets the entire experience of Thelanis in a different way than the others. The fey we are FAMILIAR with reflect human stories; that doesn’t mean there aren’t OTHER fey in Thelanis who are based around Goblin stories, or a dryad-equivalent based on how a Goblin sees a tree. With that said, some fey concepts are relatively universal; everyone has to deal with Winter sometime. In that case, what you might have is a single spirit that’s perceived in a different form by different beings; so a human sees a Ghaele of Winter as an elf-like human, while a goblin might see a bugbear with ice-crusted fur. The Ghaele might interact with human and goblin in a different way, instinctively adopting the customs they expect from their tales. If you’re familiar with Gaiman’s Sandman comics, it’s the same way beings of different races and cultures all see Dream through their own lens. So as humans, we tend to see the human face of Thelanis… but there are many others. Now, let me address a few specific questions submitted by you all. Do the fey courts ever have any interest in the goings on outside their realm, in Eberron proper? As a general rule, the inhabitants of the outer planes think about Eberron as much or possibly less than the people of Eberron think about the outer planes. They know it exists, and there are some scholars who study it, and a rare few go there, but the vast majority barely ever think about it. With that said, the primary effect of manifest zones to Thelanis is to allow travel between the two realms. In an area with a manifest zone, you could easily have more casual contact between the realms for better or for worse. These are the villages where you could have changelings swapped for human children, or where a villager might leave a gift in exchange for a fey boon. And these are also the places where you could have stories of sinister lurkers who cause mayhem in the dark of the moon, or where the Wild Hunt passes through the woods when the planes are coterminous. With the Archfey, it depends entirely on their stories. The Prince of Frost has a story that gives him a concrete, specific reasons to meddle in Eberron: he’s watching for his beloved’s return, and in the meantime taking vengeance on mortal heroes. In The Dreaming Dark series, there’s an Archfey plot playing out in the background of the main story. So if you want an Archfey to have an interest in Eberron, come up with a story that explains it. I’d love you to tell us more about the mischievous personality of the Fey. I think this mainly applies to the “background Fey” – the immortals who serve as the set dressing of Thelanis. The playful sprite, the raucous satyr, the shy dryad. To me, the key point here is that these Fey live entirely in the moment. There is no tomorrow, there is no past. There is no fear of consequence, only the pure experience of love, joy, or rage. When a dryad curses a traveler who steals fruit from her tree, it’s because in that moment this is the worst thing that could ever happen and he deserves it. While the dancing satyr has no concerns about anything other than the party we are having RIGHT NOW. So if a fey is mischievous – and not all are – it’s very much a childlike thing, pure mischief with little consequence or deep intent. I don’t think “mischievous” is a word that applies to most Archfey, unless you’re creating an Archfey whose story is all about spreading mischief (The Prince of Misrule!). There’s nothing mischievous at all about the Prince of Frost or the Lady of the Silver Tree; they are deadly serious. How would you use the Greensingers in a campaign? What are they trying to accomplish, and who are they in conflict with? The Greensingers are the least monolithic or predictable of the Druid sects. Unlike the other sects, they have no leaders or fixed communities. They are tied together by common experiences, by magical traditions, and by a shared love of fey things. But as noted in the Player’s Guide to Eberron, “The lords of Thelanis draw courtiers and entertainers from Eberron, and many Greensingers spend time in the halls of the Faerie Court before returning to Eberron to act as ambassadors, servants, and spies for the fey lords.” The critical point here is that Greensingers work for different Archfey – and that’s what will tell you what they are trying to accomplish. A Greensinger working for the Prince of Frost will watch for his lost love and attempt to lure noble heroes into his traps, and as such could be a villain in a campaign. A Greensinger working for the Lady of the Silver Tree could simply be trying to help protect Shaelas Tiraleth, and serve as an ambassador in the wider world and a guide who could take the adventurers to the tree. So when you’re dealing with a Greensinger all you know is that they have a tie to the Fey; until you learn more about WHICH Fey, you won’t know what they are trying to accomplish. Some Greensingers aren’t tied to specific Fey, but simply seek to live their life in the fey manner – living in the moment while drifting through time. What is the kind of task an Archfey could ask of players that they can’t do by themselves nor order to Greensingers? First of all, most Archfey are exceptionally powerful within their own realms. Like the Undying Court, this is a territorial thing. Some can’t ever leave their realms; others put themselves at risk or lose power if they did. So first of all, an Archfey may turn to an adventurer, warlock, or Greensinger to accomplish any task that has to be done in Eberron, because the Archfey quite likely can’t actually go to Eberron to do it. Beyond that, it’s all about the story. Again, the Prince of Winter seeks his reborn beloved and seeks to torment selfless heroes. He’s always looking for information. He might want a player emissary to recover his lost locket, to kidnap someone he thinks might be his beloved, or to engage in a feud against a particular hero. As for “Why pick a player character instead of a Greensinger,” it’s entirely up to you if a particular Archfey has any Greensinger agents. Beyond this, an easy way to tie an Archfey to a group of adventurers is if you have a Greensinger druid or Fey Pact Warlock as one of the player characters. In which case, you want to define the story of the Archfey patron, which will in turn tell you what they want and ask of their mortal agents. But again, despite their great power, most Archfey are tied to their realms and need mortal help to act in the wider world. If I want to do a short adventure in Thelanis, like recover an object there, what would make it unique, very different from a normal adventure in savage lands? It’s a world that doesn’t have to obey any of our physical laws. You can have a forest that never ends, a bottomless well, a land where the Sun never rises. It should feel like a fairy tale. Things don’t have to make sense if they fit the story. Why is the serpent just waiting at the river when the players arrive? Why is it willing to help them cross the river if they each answer a question? Because that’s how the story goes. I’ll touch on this more in a future post. How do the fey view the gods? Are there some that claim to be Dol Arrah or the Mockery, or do they claim to be the archetypes that the gods represent in myth? More the latter. The Fey don’t claim to be things; they are things. So the Prince of Frost doesn’t acknowledge the existence or sovereignty of Arawai or the Devourer; in his story, HE is the Prince of Frost, and that is all the reality he cares about. Those Archfey that pay more attention to cosmology (like Thelania in Gates of Night) would likely acknowledge Sovereigns as powerful spirits, but assert that they are gods of Eberron and have no dominion over Thelanis. With that said, you could have SOME fey who acknowledge one of the main faiths if it fits their story. Surely somewhere there is a forest in Thelanis with an old holy man in the woods; the question is whether he’s devoted to the Sovereigns – which would be perfectly valid – or to some vague, archetypal faith that only really exists in his story. How do the fey interact with historical stories? For example, Lhazaar has been historically portrayed as an explorer, but modern scholarship is tilting towards a less generous portrayal of her. Does that have an impact on any of the archfey? Likewise, do the Valenar and the Keepers of the Past have a special relationship to Thelanis because of the stories they preserve? The stories that define the Archfey aren’t history. They are archetype and fable, or more on the nose, faerie tales. There might be a story of a mythical pirate queen that inspired Lhazaar, and that’s the story that would be reflected on the seas of Thelanis. But unless Lhazaar’s actions have somehow fundamentally changed the way people view that fictional character, it wouldn’t impact the Fey. Likewise for the Tairnadal. Their heroes are REAL PEOPLE, and the whole point of what they are doing is that it preserves the spirits of those mortal heroes. To drill down on this… the stories that are reflected in Thelanis aren’t stories that anyone can concretely track to one origin. It’s not that Stephen d’King wrote a story about a pirate queen and suddenly she was in Thelanis. It’s that the story of the Pirate Queen is a classic tale known across Sarlona and especially beloved in Rhiavhaar… but no one knows exactly where it began. Azhaan’s Voyage is the earliest written version but far more people know Azhaara the Queen. As I said – no one knows if the story inspired the fey or the fey inspired the story. With that said, I could see an interesting story based around the idea that the Tairnadal ancestors are so old that they’ve created a subset of fictional tall tales, and these have in turn taken form in a realm in Thelanis. But the point is that these stories aren’t actually things the heroes really did; they’re just stories that have somehow creeped into popular consciousness, and no one knows exactly when people started telling the story that Vadallia’s eye was a tear that fell from an angel’s eye. Far from liking this, I think the Keepers of the Past would HATE it; the point would be that these Thelanian fey are sort of like parasites latching onto the story and in the process changing it. The Keepers could be worried that if nothing was done, the story might eventually be twisted to a point where it no longer supports the actual ancestor. But how can they stop it? Since Thelanis is the realm of stories… When mortals narrate or create passionate, intense or otherwise special stories artistically or with their lives, can they unconsciously give birth to lands or beings in Thelanis? e.g. Is there a ‘Mournland’-related land in Thelanis or a new Archfey? This is an echo of the preceding question. Thelanis is The Faerie Court; when I say that it’s the realm of stories, I’m specifically talking about faerie stories. First of all, if you read The Fading Dream what you’ll see is that there is an Archfey who HAS incorporated the Mourning into her personal story – but she’s done it in a way that fits the logic and form of faerie tales. The development of a new Archfey is certainly possible, but it’s the sort of thing that would generally take generations as a story becomes part of the culture – and even there the critical question is whether the story would create the Archfey, or if the birth of an Archfey would inspire and define a new story. What do the Ashbound think of fey? Are they natural, like magical beasts, or arcane? I don’t think Ashbound are innately opposed to mortal fey creatures like elves or gnomes. Powerful Fey often employ arcane magic, which would draw the ire of Ashbound. You could decide that Ashbound are inherently opposed to dryads and other immortal Fey that impose on our world, if you like the story; I don’t think we’ve called it out in canon. How did the Mourning impact things? How does the Mournland interact with feyspire(s) within? Both of these questions are integral to the plot of The Fading Dream (the third book of the Thorn of Breland series), so if you want to know my thoughts on this, read The Fading Dream! Are there still werewolves? if werewolves comes form Thelanis, does it means there are moons there? How much? Could fey become lycanthropes? Werewolves don’t come from Thelanis. Werewolves are found in Lamannia, but they aren’t natives of that plane: The 3.5 ECS says “Lycanthropes… are common in Lamannia, since many fled to this plane during the crusade that nearly exterminated them from Khorvaire.” As for whether Thelanis has moons, that varies by realm. In The Gates of Night, the moons are a way to determine which realm the protagonists are in. But the point is that those moons may not actually exist in any meaningful way. They might be made of cheese, or might just be a pool of light in the sky. The moon is there because the story calls for it to be there, not because of gravity or science. Given that, it’s POSSIBLE that a moon would affect a lycanthrope normally… or it could be that it has no impact at all, because it’s not real in the same way as the moons of Eberron. As for whether Fey can become lycanthropes, that depends on the mechanics of the system/edition you’re using. Personally, I’d tend to say that immortal fey can’t become lycanthropes by the traditional method, but their personal stories could involve something that resembles lycanthropy if it fits the story. What manner of fey are Sora Kell and her daughters? It always seemed to me that Sora Kell, at least, must be immortal. The Daughters of Sora Kell are an interesting case. Just as rakshasa are native outsiders – immortal spirits native to Eberron itself – the Daughters are essentially native fey. If you check out this Dragonshard it calls out the fact that the Daughters are the subjects of many stories, but the point is that those stories actually happened. When Beren shares a story about Sora Maenya in The Queen of Stone, he’s talking about something that personally happened to him. Whereas many (though not all) of the stories of the Archfey are mythological, metaphorical, or happened in Thelanis. This also means that the Daughters aren’t trapped by their stories the way the Archfey are. You can think of the Archfey a little like the hosts in Westworld; they are very clever and powerful, but they aren’t really in control of their own actions. Sora Katra doesn’t have quite so many strings holding her back, and she’s more invested in modern and mundane affairs. Beyond that, Sora Kell is a night hag, which have been called out from the start as being native outsiders of Eberron; they served as ambassadors and mediators during the Age of Demons. So Sora Kell is immortal (and mechanically, her Daughters are half-fiends), but she’s a spirit of Eberron as opposed to being an outsider. Setting the Daughters aside, different editions of the rules have bounced hags back and forth between being fey and just monstrous humanoids, so it’s up to you how to handle other hags. But the Daughters are definitely Eberron natives. How is it that each of them is a different variety of hag? Because they have different fathers, of course. No one knows for certain, but at least one tale claims that Maenya’s father was a giant; Katra was sired by a demon; and Teraza emerged from the womb of her own accord after Sora Kell had spent a long time exploring Dal Quor. It seems that in at least two points you contradict canon Eberron (3.5). First, Thelanis is essentially described as a plane of forests; second, in faith of Eberron is told that greensingers nave a strong organization and a kind of secret plan for melding Thelanis and Eberron. Just asking if you changed your mind (in the first case) or why you disagree (on the second). I used to put a disclaimer at the start of each of these posts that said “Things I write here may contradict canon.” Everything you read on this site is my version of Eberron, and may not match canon sources – especially because canon sources themselves often contradict themselves. Case in point: *I* wrote the Greensinger entry in the Player’s Guide to Eberron, which predates Faiths of Eberron. Meanwhile, Faiths of Eberron is one of the few Eberron books (including Forge of War, Magic of Eberron, and The Explorer’s Handbook) that I had no involvement in. So if I disagree with it, it would be because someone else took it in a different direction than I originally intended. However, I just glanced over Faiths of Eberron and I don’t particularly agree with your interpretation that they have “a strong order.” Throughout the entry it calls out their fierce individualism and states straight out “The sect is generally reclusive, with no formal organization.” It posits that what unites them is a shared belief that the planes are part of nature and should be made manifest in it, and that they will occasionally work together to help open planar connections. But they aren’t a concrete organization with a concrete goal; they are a very chaotic organization with an extremely loosely defined goal. Meanwhile, they are often more driven by the personal bonds they have made with Archfey and other planar entities. As for the second point, it’s true: the 3.5 ECS says “Thelanis is a realm of rugged natural beauty—primarily lush forests and crystal-clear waters.” My point is that these places exist and may form the majority of the environmental types in Thelanis… but not all of them. This is what happens when you have a single paragraph to describe an entire layer of reality, and in The Gates of Night the first vision we have of Thelanis is a rocky moor, not a lush forest. It’s not that I changed my mind, as much as there is more to the plane than the 3.5 description could encompass. Thelanis is the place where we see the magic that we want to be in the world… but isn’t Eberron highly magic? Magic is everywhere there, do they need Thelanis? There’s magic, and there’s magic. First off, Thelanis is eternal. It existed long before humanity ever mastered arcane or divine magic. But beyond that, Tolkien hits a critical point in his essay On Fairy Stories: “Faerie itself may perhaps most nearly be translated by Magic—but it is magic of a peculiar mood and power, at the furthest pole from the vulgar devices of the laborious, scientific, magician.” The arcane magic that is the cornerstone of Khorvaire is the very definition of the “scientific magician” – while the magic of Thelanis remains mysterious and wild. If you read The Gates of Night or The Fading Dream, you can see people from Eberron bumping into the wild fey magic, and how it differs from the world that they know. Thelanis is the plane of fairies. But Thelanis is the plane of stories. A lot of stories don’t speak of fairies, but for same of gods. Why don’t we have Auron and the shadow battling in Thelanis? Why don’t we have some great Hero of the last war? I touch on this in previous answers, but it’s because Thelanis isn’t simply the plane of Faerie or the plane of Stories… it’s the plane of FAERIE STORIES. As noted in Tolkein’s essays, a faerie story doesn’t even have to involve actual faeries; it’s about its tone and style. The stories that define Thelanis aren’t based on concrete events. They aren’t chronicles of history, or stories created by a single mortal mind. They are about archetypes and about wonder. As I said above, you could have a realm in Thelanis inspired by the Tairnadal ancestors, but if you did it WOULDN’T actually depict them accurately or re-enact their actual deeds; it would be about the faerie stories inspired by the truth, the things people want them to have done… even if those deeds are wildly impossible. Humans see the Prince of Frost as an elfy creature. Bugbears as a bugbear. What about a recenti created warforged, that don’t know and story nor understands love? It’s a good question. To be clear, my concept is that most Archfey have a default form. It’s not that everyone sees them differently; any human/elf/etc will see the Prince of Frost as “Elfy”, and if the two of us drew a picture of him it would look the same. Because elves fit in our cultural view. A bugbear raised among goblinoids generally isn’t thinking of things in terms of humans or elves, and thus he puts a goblinoid spin on it – but all goblinoids would likely see the same shape. So taking your warforged, as long as the warforged spent its life among humans and elves – which most have – it is logical for it to perceive the default “elfy” shape. If you took a warforged that had never seen humans, then you would say “How would it personify winter?” Perhaps it would be a frost-covered warforged. Perhaps a warforged made out of ice. It’s really up to you. Tied to this: In The Gates of Night, the warforged Pierce sees Thelania in the same form as the others. But the feast she serves appears to be everyone’s favorite meal. For Pierce, who has no experience with food, this manifests as a flavorless paste. Add your questions and thoughts about the Fey below! This entry was posted in Eberron FAQ, Gaming Features, Uncategorized and tagged Dragonmark, Dragonmarks, Eberron, thelanis by Keith Baker. Bookmark the permalink. In The Secrets of Xen’drik, it says that the Nymph Queen Ellida stepped through and decided to stay a while. Just wondering how a queen, one satyr, six grigs and three pixies are surviving there. Xen’drik seems one incredibly difficult place to survive, magical or not. Remembering how well you wrote about just getting through the jungle in The Shattered Land and The Gates of Night, I wonder how even a fey queen could decide to stay in a land so magic blasted. In Gates of Night, it seems Thelania wields considerable power, even through conduits like Flamewind and the water elemental, and truly feared the impact of Dal Quor on her eventual realm through what would have happened in Eberron. But does that mean that she only will take indirect action of it is just a threat to Thelanis? The point here is that outside their realms or direct spheres of influence, they essentially HAVE to take indirect action. It’s possible that an Archfey thought the Xoriat Incursion was a threat to Thelanis and DID take action – but that action might have been giving a gift or a boon to a hobgoblin hero, something that could turn up again today. But there’s a bigger issue here, which is that THELANIA MIGHT BE LYING. It is possible that she is truly concerned with the fate of the mortal world – more so than the typical Archfey. But it’s ALSO possible that she is telling the protagonists a story in order to get what she wants from them. It’s a good story. Their world is in danger, and they can use the help that she offers. But I’ll point out that there’s a secondary story running here – something that continues to play out in The Son of Khyber – suggesting that like the Prince of Frost, Thelania is carefully manipulating events to play out a chapter in her personal story. I don’t want to go any deeper than that as I don’t have a way to hide spoilers here. But Thelania is definitely playing her own game that has little to do with the fate of Eberron, and to some degree she is telling the group what they need to hear so they’ll do what she wants. The fact that it helps them is convenient – the best lies contain grains of truth. In The Secrets of Xen’drik, it says that the Nymph Queen Ellida stepped through and decided to stay a while. Just wondering how a queen, one satyr, six grigs and three pixies are surviving there. Xen’drik seems one incredibly difficult place to survive, magical or not. There’s a few factors here. First off, I’d say that they are likely dwelling in a manifest zone linked to Thelanis; this is how they just “stepped through” in the last coterminous phase. So they are likely in a spot that is already somewhat fey-friendly and that might naturally (well, supernaturally) repel some of the normal threats of Xen’drik. I don’t see them as wandering far; they’ve come through, set up court, and are now engaging in their timeless revels. As immortal spirits, they don’t have to eat or drink to survive – though they might be able to conjure up intoxicants to keep the party going, they don’t have to deal with many of the troubles mortals would. Basically, they’ve pulled a little pocket of Thelanis into Eberron… which is what you see in the Twilight Demesne and other Thelanian manifest zones. Thanks Keith! I know I had questions about the fey, but I can’t remember all of them right now. Here are a few that are generally religion-themed. How do the fey interact with historical stories? For example, Lhazaar has been historically portrayed as an explorer, but modern scholarship is tilting towards a less generous portrayal of her. Does that have an impact on any of the archfey? More recently, could the same thing happen if viewpoints on Tira Miron change? Likewise, do the Valenar and the Keepers of the Past have a special relationship to Thelanis because of the stories they preserve? I’m adding this to the main post, but I’ll post the answer here, too. How do the fey interact with historical stories? I just added (and then expanded) an extensive answer to this towards the end of the post. So, what manner of fey are Sora Kel and her daughters? It always seemed to me that Sora Kel, at least, must be immortal (in my head she is a lot like Baba Yaga). Good question! I added it to the end of the main post. Reading your response, I thought of another question. How is it that each of them is a different variety of hag? Kel is a night hag, and IIRC, Teraza is a dream hag, Katra is a green hag, and Maenya is an annis. When eading this article, I can’t help but to think of the show “Once Upon a Time” that my family has been watching recently. Could those kinds of events transpire? On a different note, any ideas on how Thelanis and the Fey might impact the Principalities (where I currently am running a campaign)? Could those kinds of events transpire? You can definitely have inhabitants of Thelanis who end up on Eberron, either by choice or being trapped. So you certainly could have a hidden community of Fey in Eberron who are characters from classic (Eberronian) stories. With that said, having that kind of density of character would be unusual (just as it is in OUaT) – normally these things are spread across different realms. I’ll answer the other question in the main article, though it will take a little bit before the answer shows up. On a different note, any ideas on how Thelanis and the Fey might impact the Principalities (where I currently am running a campaign)? I changed my mind. This article talks about what Thelanis and the Fey are like, but I think there’s another entire post on the subject of “But how do you actually use any of this in a campaign” – and I’ll write that next. It seems that in at least two points you contraddict canon Eberron (3.5). First, Thelanis is essentially described as a plane of forests; second, in faith of Eberron is told that greensingers nave a strong orgsnization and a kind of secret plan for melding Thelanis and Eberron. Just asking if you changed your mind (in the first case) or why you disagree (on the second). On the other hand, the post is very beautiful to read, as always, but I still am confused. 1) Thelanis is the place where we see the magic that we want to be in the world… but isn’t Eberron highly magic? Magic is everywhere there, do they need Thelanis? 2) Thelanis il the plane of fairies. But Thelanis is the plane of stories. A lot of stories don’t speack of fairies, but for esame of gods. Why don’t we have Auron and the shadow battling in Thelanis? Why don’t we have some great Hero of the last war? 3) Humana see the prince of first as an elfy creature. Bugbears as a bugbear. What about a recenti created warforged, that don’t know and story nor understands love? JRR Tolkien wrote an essay, “On Fairy Stories”, which was published in his book “Tree and Leaf”, and discusses what makes a fairy story, even if it doesn’t include fairies. The vibe seems in keeping with what I have seen Keith write elsewhere. I am pretty sure the text can be found online if you google “tolkien on fairy stories”. I hadn’t encountered this essay before, but it’s great. I appreciate that he literally addresses the difference between Xoriat, Dal Quor, and Thelanis: They, therefore, stupidly and even maliciously confound Fantasy with Dreaming, in which there is no Art; and with mental disorders, in which there is not even control: with delusion and hallucination. Most good “fairy-stories” are about the adventures of men in the Perilous Realm or upon its shadowy marches. Naturally so; for if elves are true, and really exist independently of our tales about them, then this also is certainly true: elves are not primarily concerned with us, nor we with them. Our fates are sundered, and our paths seldom meet. Even upon the borders of Faërie we encounter them only at some chance crossing of the ways. All good questions and I’ve answered them in the post. Two key points: EVERYTHING I post in this blog are my personal ideas about Eberron and may contradict canon; and Thelanis is first and foremost the FAERIE Court, so when I say it’s the realm of stories, I specifically mean FAERIE stories. So it’s not about history, recent fiction, religious mythology, or every style of tale that’s told. The essay by Tolkien referenced in these comments pretty much hits exactly what I’m embodying with Thelanis. This is all fascinating material. One small question: How would a spell like “discern location”, which per The Rules can locate beings or objects even in other planes, work with regard to Thelanis? If I had to guess, I’d say that if you cast it in Eberron with regard to something in Thelanis, it would give you a straightforward answer. But if you then went to Thelanis, say through a manifest zone, and cast it again, the result might be confusing or ambiguous. Less powerful magics like “find the path” would be even more scrambled. Re: Fey magic vs. “scientific magic”, I can imagine an artificer being both frustrated and fascinated by fey magic. As a class, they must believe that down deep at the root of things, all magic is one, and yet… As a guess, I’d say that if a curious mortal asked one of the Archfey what the relationship of fey magic to arcane or divine magic is, the fey might reply (if their story made a straight answer suitable and they didn’t simply smile and reply, “Lemon curry.”) that fey magic cannot be limited or defined…and so must *include* as a special case, “scientific magic”, but don’t expect to find some underlying logic that would explain both. It just isn’t there. One small question: How would a spell like “discern location”, which per The Rules can locate beings or objects even in other planes, work with regard to Thelanis? If I had to guess, I’d say that if you cast it in Eberron with regard to something in Thelanis, it would give you a straightforward answer. But if you then went to Thelanis, say through a manifest zone, and cast it again, the result might be confusing or ambiguous. Less powerful magics like “find the path” would be even more scrambled. It’s an interesting question. Looking at the description of Discern Location, I think it would work exactly as described: “The spell reveals the name of the creature or object’s location (place, name, business name, building name, or the like), community, county (or similar political division), country, continent, and the plane of existence where the target lies.” So, Daine is in the dungeons of the Prince of Frost, in the Vale of the Long Night, in Thelanis. The issue is that knowing that fact doesn’t tell you how to get to the Vale of the Long Night when you’re starting under the Deepwood Moon. Likewise, Find The Path allows the recipient to “find the shortest, most direct physical route to a specified destination” in the same plane; the issue is that there may not BE a physical route between the Deepwood Moon and the Vale of the Long Night. They are different layers of Thelanis and you have to find the NONphysical path that lets you cross between them. And this is exactly the sort of thing you see in The Fading Dream. All magic may BE one, deep down… but the manner in which the Fey interact with it is completely different than the arcane or divine lenses humans use. In some ways you could say that Eberron is a world where magic exists, while Thelanis is a place where the world IS magic. Concerning the relative “unreality” of moons in Thelanis realms compared to Eberron, I would tend to assume that whatever else happens to be true of a Thelanis realm’s moons, they’re closer and smaller than Eberron’s moons. How close would vary from dozens to a few hundred miles — more in the realm of what people can easily imagine and relate to than the thousands to tens of thousands in the Material Plane — unless the story needs a moon to be closer. Heck, if a story involves visiting a moon, reaching the right part of the story would likely make the moon “closer”, so Dimension Door works when Teleport was necessary to get there before. Of course, if a moon ISN’T important to the story, visiting that picture painted onto the crystal dome of the sky (for example) wouldn’t necessarily be any more than a novelty. There is, perhaps, something of a paradox involved in trying to use a realm of traditional story in an RPG — a medium where choice is crucial and half the point is that even if there’s a planned story in mind you can twist it, sequence-break it, or turn it into something else. Should Thelanis be avoided entirely if a group hates railroads? How does one run a story in Thelanis without holding the players’ hands? Personally, I think the collaborative nature of RPG storytelling is the best part of it, so I definitely don’t want stories to feel like disempowering railroads. I’ll talk more about the details of how I’d handle it in a post next week. I’m pretty sure I know the answer to this one, but I wanted to check for clarity/discussion anyhow. If I recall correctly, the Prince of Winter was a pretty high-level threat. Do all Arch-Fey have to have to have that high level of power, or could you have something like a bog standard dryad, pixie, or gremlin become an Arch-Fey if they are the main characters of their own stories? Or would it be more appropriate for a lower level Arch-Fey to have a couple class levels instead? You don’t have to be an archfey to be a cool, unique fey or to have your own story. Looking to The Gates of Night, The Woodsman is technically the Archfey of the Deepwood Moon, but the dryad of the Crooked Tree has her own story within that realm. Previous comments brought up “Queen Ellida” from Secrets of Xen’drik, who is mechanically a straight-up no-frills nymph who has wandered out of Thelanis to have a story in Eberron. That doesn’t make her an “archfey” – it makes her a unique immortal. Basically, there’s room between the “background immortals” and the Archfey superstars for unique fey that have their own roles and stories despite not having the power levels of an Archfey. So personally I think “Archfey” is a term like “Archdevil”, that does imply a certain power level. But you can have unique and interesting immortal fey who aren’t Archfey. A thought just crossed my mind… if there were a fairy tale about a lich who bound The Traveller for the three Nights of the Long Shadow and dispensed gifts in the god’s stead, would an archfey tied to the lich in the story most likely be a regular undead, a fey that has undead-like abilities, or an undead creature that was once a fey? It’s a difficult question on multiple levels. First, by invoking the Traveler would generally this a myth instead of a faerie tale. Myths involve gods; history involves recorded events and real people; the stories of Thelanis generally don’t involve either. However, I might make an exception for the Traveler, who generally straddles the line between myth and folktale. Now, the next question is why is the bad guy a lich? Again, this isn’t based on something that actually happened – so it’s not “He’s a lich because he just happened to be a lich.” From a story perspective, why is it important that he’s undead (as opposed to being a clever gnome, or the Prince of Frost seeking mortal love)? WHY is he undead? How is it actually important to the story? Essentially, if it’s NOT that important… if it’s just that he’s “lich-like”… then I’d make him a fey that has undead-like abilities. If it is somehow VERY important that he is specifically a lich, then I’d make him an undead creature that was once a fey. I was thinking about how different Christmas and/or Disney movies could translate into fairy tales for Eberron. In this case it was The Nightmare Before Christmas, which is how the Traveller got involved (taking the place of Santa Claus in the movie), while the lich would be Jack Skellington. Maybe an angel or a generous fey would be more appropriate for the lich to abduct to translate the spirit of the movie more appropriately. Either way, in this case, I’d likely say that being undead isn’t important part of Jack’s character, being terrifying is. What he has to learn in the course of the story is when and how to be generous. His undead state is merely aesthetic to the movie, so we’d be looking at a scary fey lord with a skeletal appearance and possibly some necromancy/undead related abilities. The way A Nightmare Before Christmas has Santa’s Christmas realm separated from the Halloween realm seems to fit the notion of different layers of Thelanis well. Don’t forget Jack’s title, the Pumpkin King, which goes very well with other Archfey titles like the Prince of Frost, the Green Lord, the Witch of Fates, and so on. Regarding the line between myth and folk tales, though, I’m curious how this relates to the notion that the Traveler might have been “inspired” by creatures such as Sora Kell. After all, there is a strong connection between deities worshipped (currently or previously) in our world and later folk tale characters – such as the Norse god Odin and the Wild Hunt inspiring tales of both Santa Claus, the Elf King and Harlequin (through several re-tellings, interpretations and bad translations). Regarding the line between myth and folk tales, though, I’m curious how this relates to the notion that the Traveler might have been “inspired” by creatures such as Sora Kell. The thing I should have clarified is that there’s no evidence that events on Eberron create stories in Thelanis. Rather, it seems likely that Thelanis is tied to the collective unconscious of Eberron – that we create stories that resemble the fey, not that they are transformed by the stories we create. So the realms of Thelanis don’t reflect HISTORY. Many myths themselves are based on history; both the Silver Flame and the Sovereign Host are tied to events from the Age of Demons. The issue is that there could be places where the path of myth and faerie tale cross. My point about the Valenar is that you wouldn’t have an Archfey based on a real Valenar ancestor; but you might have an Archfey whose story is CLOSE ENOUGH to an ancestor’s deeds that the two start getting confused. The same could be true of, say, Sovereigns. SOME of the stories about Aureon are myths tied to the deeds of the dragon Ourelonastrix; and others might be tied to an Archfey with similar traits. But it’s not that the stories CREATED that Archfey; it’s that the Archfey bled their way into the myth. All of this is especially relevant when dealing with the Traveler, who among all the Sovereigns is the one said to walk the world. So the question is: Is the Traveler one individual entity? Or are there multiple beings who use the mantle and inspire the tales, possibly including Sora Kell, Archfey, Rakshasa, Dragons, or others? Any chance we could know who those fathers are? Are either of them still living? It’s not a detail that’s ever been established in canon; it’s the kind of thing I usually leave open so an individual DM can fill in the blank to meet the needs of their story. With that said, given that we DON’T know who they are, it suggests to me that they aren’t still ambulatory. I’d probably say that Sora Kell killed and ate the giant, and she trapped the demon in a shard that she wears on a charm bracelet (each charm holding the essence of a different immortal lover). Looking to what sort of demon, probably something Khyber-spawned. Katra is deceptive, manipulative, and charismatic; she’s a powerful shapeshifter; all of these lean towards a rakshasa. Depending how old Katra is, it could have been a doomed love in the height of Ashtakala. Even if you don’t want Katra to be that old (and that’s pretty darn old), given that Sora Kell is herself an immortal and they don’t reproduce normally, it’s possible that Kell carried her daughter for tens of thousands of years before giving birth to her. That actually gives me a lot of fuel for my ongoing campaign, the Daughters play heavily in. Thank you!